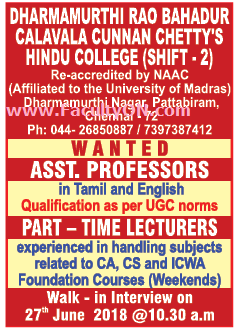 DRBCCC Hindu College, Chennai has advertised in THE HINDU newspaper for recruitment of Assistant Professor / Lecturers jobs vacancies. Interested and eligible job aspirants are requested to walk-in on 27th June 2018. Check out further more details below. About College: Our College was started in the year 1969 at Pattabiram, a semi-urban area of Chennai, to commemorate the birth centenary of our illustrious founder, Dharmamurthi Rao Bahadur Calavala Cunnan Chetty. It is under the Management of Dharmamurthi Rao Bahadur Calavala Cunnan Chetty Charities. To cater to the ever going demand for higher education, self-supporting courses were stated in the same campus in 1995. The college is situated in the Avadi Municipality area on the Chennai-Tiruvallur High Road in a campus of 30 acres. The college is privileged to have a railway station in its name just across the highway. How to Apply: Interested and eligible candidates are requested to appear for Walk-in interview along with CV, originals & copies of certificates and recent PP size photo to the walk-in address provided here.